Jeffrey Welch's Blog: Why Do Dogs Sneeze? As most dog owners and aficionados understand, a dog’s nose is a powerful sense organ. Dog nasal passages are larger and better developed than those of humans — as such, they also tend to be better equipped against natural, biological agents. Studies have recently shown that the canine nose is home to a diverse microbiome, offering a wealth of protection against disease in this vitally important part of the body. So, why do dogs sneeze? Are dog allergies to blame for dog sneezing? A Beagle dog sneezing. Photography by igorr1/Thinkstock. Let’s debunk a popular and persistent myth. Dogs do not experience allergic reactions in the same way that people do. We know our own common responses and reactions, including swollen, watery or itchy eyes and repetitive sneezing. In dogs, sneezing is one of the least common reactions to allergens, be they to food, parasites, scented candles or household cleaning products. Allergies are conditions and reactions that develop over time and repeated exposure to whatever the particular stimuli. Just as a wet or dry nose is not a reliable indicator of a dog’s general health, neither is sneezing a reliable sign of dog allergies. For illness, we look to a dog’s activity level and eating habits as symptoms. For allergies, dogs are much more likely to develop discolored and itchy patches on their skin. So, what causes sneezing in dogs? What is a sneeze? At its most basic, a sneeze is a reflex action, in which the body attempts to expel some foreign object or irritant that has become trapped in the nasal cavity. Whether it is dirt, smoke or a tiny insect, the irritant’s presence disturbs the nasal lining, and sneezing in dogs is their first and easiest defense mechanism. If sneezing fails to dislodge the unwelcome guest, it can become more bothersome. Dogs with a stubborn irritant in their nose will relentlessly rub their noses or heads against couches, trees or the ground, or start pawing continuously at their faces. The longer an external irritant or foreign object is caught in a dog’s nasal passage, the greater the chance that it might lead to fluid buildup and discharge. This can be mucus, pus or even blood, given enough time. Any of these can spur a secondary infection. Your dog might sneeze because of an irritant every once in a while. Parasites — namely, nasal mites — can cause repetitive or chronic sneezing in dogs . At only about a millimeter in length, these mites can be difficult to spot in and around your dog’s nose when they first establish themselves. Like the mites that cause mange, advanced symptoms won’t manifest until the immune system is overwhelmed and unable to keep them in check. A runny nose can accompany a nasal mite infestation, eventually becoming a bloody discharge as the mites reproduce, and regular sneezing fits may become the norm as the nasal lining is affected by constant irritation. Respiratory diseases like canine influenza might certainly cause dogs to sneeze. As with many of the afflictions on this list, though, sneezing may be the loudest and most demonstrative symptom, but it certainly won’t be the most troubling. 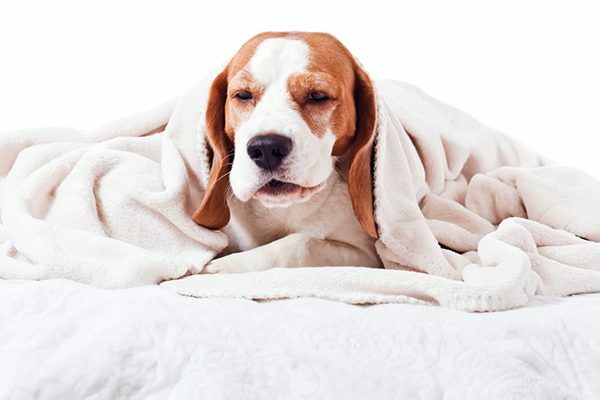 In the case of canine influenza virus, sneezing is one symptom, along with fever, nasal discharge and labored breathing. Rhinitis and sinusitis are conditions in which the nose itself or the interior nasal passages, respectively, become inflamed. Dogs might sneeze as a result of inflammation, but dog owners will notice more dramatic changes in these cases. Causes of swelling might range from fungal infections to dental diseases and from irritants to tumors. Beyond a simple increase in sneezing, dogs with nasal inflammation, external or internal, might lose interest in food or have fluid discharges running from the nose or mouth. Malignant growths such as carcinomas or sarcomas can develop in and around a dog’s nasal area with age. They tend to afflict very old dogs — over the age of 10 — and some larger dog breeds as they approach seniority. Sneezing is one symptom of a canine nasal tumor in an older dog, but watch out for labored breathing, discolored fluids (like pus and blood) dripping from a dog’s nose or distended skin around the nose and face. Is your dog sneezing a lot? See a vet! An ordinary dog sneeze is an ephemeral, even amusing phenomenon. If your dog is sneezing constantly and repetitively, or if sneezing is accompanied by swelling, fever or fluid discharge, please consult with your veterinarian! The post Why Do Dogs Sneeze? appeared first on Dogster.